​Manchester United have been linked with too many centre-backs to keep track of over the last 18 months as the club look to strengthen a porous defence that has consistently proven to be the weakest part of the team so far this season. United are well stocked in terms of midfield and attacking options, as well as having the best goalkeeper in the world, who remains relatively unprotected. Leaking goals and failing to keep clean sheets will prove to be their downfall in the hunt for trophies if the problem is not fixed. In Victor Lindelof, United have a top emerging centre-back who appears to be growing in confidence with each passing week. The 24-year-old Swede endured a slow start to his Old Trafford career, but he reads the game very well and has a style not dissimilar to Rio Ferdinand. Lindelof can become an elite centre-back within a couple of years, yet United need a stronger, more established foil who can lead the defence immediately. That player is not Chris Smalling, who has been a valued servant but is short of 'world class'. It is also not Phil Jones, a player who grazed his face on the turf in his last outing and is still prone to mistakes and injuries. Nor, unfortunately, does it seem to be Eric Bailly, whose rashness hasn't dissipated as hoped. Smalling, Jones and Bailly don't need to be shown the door. Each is good enough to come in and perform as a backup when required, but United simply have to have a better starting centre-back to pair with Lindelof if the club is to return to its former glory. 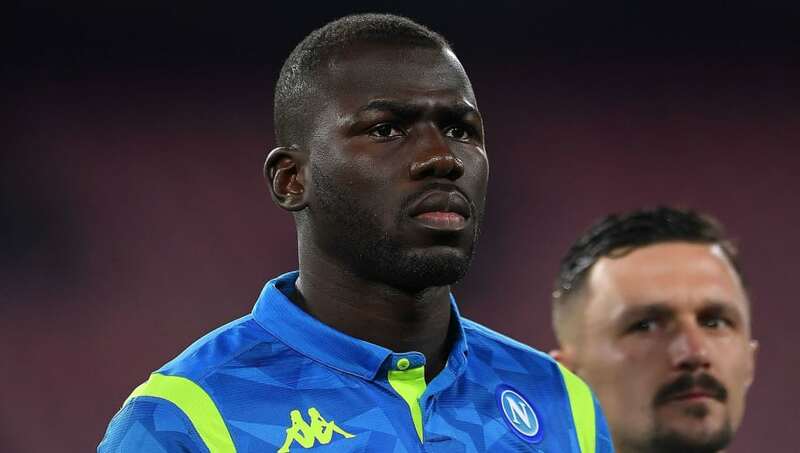 With speculation about Harry Maguire and Toby Alderweireld dead or dying, the defender most frequently linked with United at this moment in time is Napoli man Kalidou Koulibaly. The question is, is he the right defender for United to pursue? There are, of course, dangers involved. Firstly, the price, which has already spiralled considerably since the rumours became more serious. As recently as early December a report from The Times suggested that Napoli wanted £90m for Koulibaly. Yet less than a month later, The Guardian was already quoting Napoli's asking price at an even more lofty £107m. Napoli president Aurelio de Laurentiis also has a reputation being a fierce negotiator and the Italian club are not exactly known for selling their stars on the cheap - Juventus were made to pay €90m for Gonzalo Higuain in the summer of 2016, for example, and didn't exactly get their full money's worth from the striker before loaning him out just two years later. There is a certain element of having little choice but to pay the asking price if you want to build a successful team. That is certainly what Liverpool did when it came to signing Virgil van Dijk this time last year and it has worked wonders for them. The fact that the transfer market has already moved on from that £75m world record fee is an unfortunate side note. If there is anyone in the world who can afford to spend immense sums on players, it is United. The club recorded record revenue of £590m for the 2017/18 season and predicts that the 2018/19 figure will well surpass £600m, potentially even reaching an enormous £630m. The knives will be out should United meet Napoli's reported demands and make Koulibaly by far the most expensive defender of all time. Just one mistake and the phrase '£100m flop' won't fail to make it into bloodthirsty press reports. No footballer is mistake-free, none. There is also the issue of whether Koulibaly is as good as his reputation would have people believe and whether he is the right fit for United and their needs. All too often in the digital age, hype and excitement from social media users tends to warp perceptions of quality. He is certainly a good age, only three weeks older than Van Dijk at 27, to be 28 by the start of next season. His enormous physical frame, prompting the nickname 'K2' after the Himalayan mountain, would also promise to stand him in good stead for the bruising world of the Premier League. Yet the player has also earned praise for his ability on the ball, short passes, bursts of pace, danger awareness and even goalscoring ability - five Serie A goals last season, including a late winner against Juventus in April that kept the title race alive, are testament to that. It all reads as though he is a slightly more technical version of United legend Nemanja Vidic. And praise for Koulibaly doesn't come from a much higher authority than current Napoli boss Carlo Ancelotti, who mentioned the Senegalese star in the same breath as many of the greatest defenders of modern times, all of whom he has personally managed, when speaking at a press conference in November of last year. "Surely he is among the greatest I have trained like Thiago Silva, Sergio Ramos, [Alessandro] Nesta, [Paolo] Maldini, [Fabio] Cannavaro, [Lilian] Thuram, [John] Terry. At the moment he is certainly among the best in the world," Ancelotti said. Manchester United desperately need a world class centre-back. The price is what it is and not coughing up the cash to chase unpolished gems puts the club at risk of failing to move forward again. Napoli's Kalidou Koulibaly ticks all the boxes, that's why he is the right man for the job.